Why should I go to a licensed eyelash extensions studio? 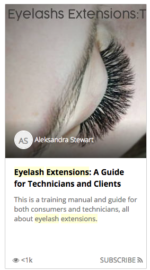 The first thing you need to know about eyelash extensions, is that unlike getting your teeth cleaned or hair cut, eyelash extensions are still not regulated by various government or professional bodies. Perfect You is lobbying the government to change this, and we are creating industry standards, which will hopefully be implemented and enforced one day. In the meantime though, there is a great deal of risk to consumers in what is currently a “wild west” type industry. Think about it for a second. 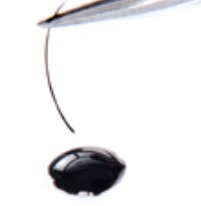 Someone is applying glue near your eyeballs, with sharp tweezers, for up to 2 hours. Dentistry is regulated for good reason, and we believe eyelash extensions should be as well. But the question remains: is there any level of licensing or certification that could apply to this industry? The answer is twofold. On the training side, technicians should be deeply deeply trained by someone who has at least 2 years of field experience. In our estimate, this covers about 50% of technicians operating in Ottawa today. Likely around 50% of them have been trained by someone with significant experience. On the regulatory side however, very few establishments have exposed themselves to the rigorous inspection, health and safety standards of various levels of government. In the case of Perfect You, we are inspected by the City of Ottawa Health department, just like restaurants. We are open to these inspections, because it helps us improve on absolutely anything we can, for the health and safety of our clients. We also have our own safety standards, which we have developed since being in business for almost 10 years. For instance, if a client has an allergic, or any type of reaction, it is standard practice for us to discard all implements that came in contact with the client. This is just one example of a health and safety procedure which minimizes risk to everyone. What is the difference between “regular” eyelash extensions, and multi-dimensional eyelash extensions? The difference between 1D (or regular) eyelash extensions and all other extensions, is very simple. Regular eyelash extensions are a single strand, which fits directly onto a single eyelash. They looking like a long, and slightly darker single eyelash (see the photo below). A single “regular” eyelash extension being dipped in adhesive. Multi-dimensional lashes are made of the exact same material as regular 1D extensions, but they are forked. For instance, a 2D eyelash extension has 2 “prongs”, a 3D lash has 3 “prongs” and so on. Until recently, the number of strands was limited to a maximum of 5 (5D lashes). However, now the strands are up to 15 with a new procedure called “mega volume lashes”. NOTE: If someone is advertising “MegaVolume” they should be prepared to describe what level of multi-dimensionality they are offering. Truly mega volume lashes start at 6-D, and go all the way to 15-D. See the 9-D lash below. Which type of eyelash extensions are right for me? The first thing we’d like to get out of the way, here in 2017, is that mink eyelash extensions are no longer a valid choice. This is an unpopular view, but we have not had good experiences with mink eyelashes, compared to what is available on the market today with synthetic lashes. Please see our recent post about the disadvantages of mink eyelashes, and please spread the word. To our knowledge, Perfect You is the first eyelash extensions studio to speak out against mink eyelashes, on the basis of our strict quality control standards. In terms of the other factors (1D versus multi-dimensional or mega; long versus short; thickness, colour and curl), this is a personal preference, but is also something that should be taken up with an extremely experienced eyelash extensions technician. An experienced technicians will have several trays on hand, as well as various photos to help you to see what might be right for you. Some of the factors are: the size and shape of your face; the occasion for the lashes (everyday or a big occasion like a wedding); the length and curl of your existing lashes; your own style, politics and personality. How long to eyelash extensions last? When eyelash extensions are applied by a professional at Perfect You, they will last 4 to 6 weeks, before a touch-up is required. Below is a photo of a set by Joey at Perfect You, right after they were applied, and after 4 weeks of regular wear. To achieve long lasting eyelash extensions, you have to go to an experienced technician at a licensed studio. There are no shortcuts to amazing eyelash extensions. Is the glue harmful or toxic? The glue that is used is generally non-allergenic. It has similar properties to the adhesives used by doctors in surgery. It is designed to be completely safe. However, some technicians will use glue that is extremely fast bonding, but contains more harsh chemicals. If you have sensitivity to the glue, you should not proceed with eyelash extensions AND you should get your extensions removed by a professional as soon as possible. 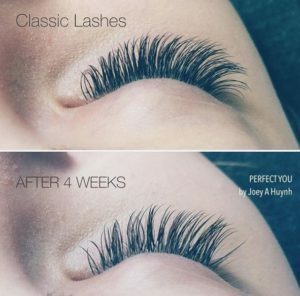 Perfect You offers free removal service for anyone who is unhappy or uncomfortable with their eyelashes, for any reason. 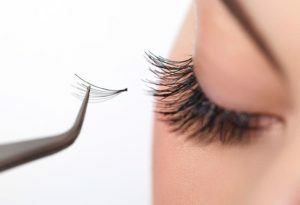 For more information about eyelash extensions adhesives, click here. Are there other risks to eyelash extensions? The other risks to eyelash extensions are really common sensical. Someone is working close to your eyes, so utmost care is required to insure that you are safe. At Perfect You, you are in a private room, with very good light (including windows in every room). We do not allow anyone else in the room during your procedure, so that there is no risk of someone bumping into your technician or table. Also, we encourage each technicians to work in their own manner, so that they can be as focused as possible. Some technicians prefer to listen to music on earphones, and others are happy to talk to clients. It’s important to know that each of these “quirks” is based on our concern for health and safety. The more comfortable the technician, the better the result. These are highly skilled artists, after all. The most common side-effect to eyelash extensions is sensitivity to the gel pads that are used during the procedure. Sometimes a client will have irritation on the eye, based not on the eyelash extensions adhesive, but on the gel pad adhesive. This can be alleviated with gently washing the area, or -in some case- applying a topical cream. In some cases, there can be enough irritation that it’s almost like a small laceration. It is very sensitive skin, after all. We always do our best to be delicate and gentle. We recommend talking to a doctor or pharmacist in these cases. And, we are always available to take a look as well. Why do eyelash extensions fall off? If properly applied, eyelash extensions will not fall off. They eventually thin out, based on the natural cycle of growth and re-growth of your own natural lashes. The only way eyelash extensions actually fall off the eyelash themselves, is due to improper application, extremely bad aftercare, or using the wrong glue to apply the extensions.